Although Johnny Appleseed supposedly planted hundreds of trees just by scattering seeds, planting a tree on your property typically requires a bit more planning and preparation, especially if you’re incorporating your new tree into a particular landscape design. Whether you’re transplanting a tree or purchasing one from a tree nursery, most trees come with a root ball, which is simply the mass of roots surrounded and protected by a ball of soil. Although it requires only basic gardening tools, planting a tree with a root ball is a smoother process if you have the help of a willing assistant. Choose an appropriate location for your tree, ideally one that is in full sun. 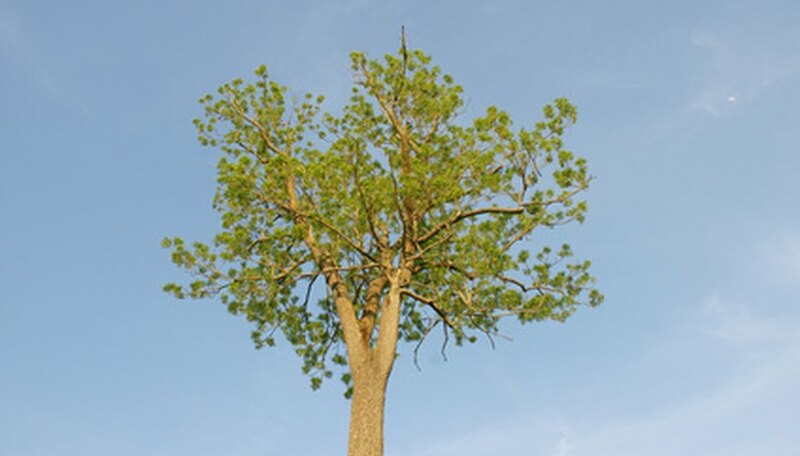 Look overhead to ensure that there are no power lines or other obstacles that might hamper the full growth of your tree’s canopy as it matures. Don’t forget to think about your current landscaping design and try to incorporate your tree into that design. Measure the height and diameter of the root ball. Remove any sod covering the planting site. Dig a hole that is slightly less than the height of the root ball but twice as wide; for example, if your root ball is 12 inches tall and 10 inches wide, you’ll need a planting hole that is 10 to 11 inches deep and at least 20 inches wide. Mound the dirt in a loose pile next to the planting hole. Remove the pot or burlap sack from your tree’s root ball. Lift the trunk of the tree while a partner supports the root ball; lower it gently into the planting hole. Locate it in the center of the hole, making sure there is equal space on all sides of the root ball. Check to ensure that the topmost root in the root ball is level with or slightly above the soil level around your planting hole. Straighten the tree in the hole, and have your partner stand back at least 15 feet from the tree in two different directions to verify that the tree is straight. Fill in the soil around the base of the root ball, scooping it back into the planting hole with a shovel. As you fill the hole, slide the blade of your shovel straight into the topsoil to ensure that it is not packed too tightly and that all large clods of dirt are broken up. According to the Hillsborough County Cooperative Extension, you should stop putting in topsoil approximately 1 to 3 inches from the top of the root ball, depending upon the size of the tree that you’re planting. Pour at least 10 gallons of water into the root ball and the surrounding loose topsoil. Sprinkle mulch around the exposed section of the root ball and across the entire area of loose topsoil. Water your tree daily for at least 2 weeks and then every other day after that for another month in order to promote proper root growth. Don't step on the topsoil to pack it around your tree, since doing so could compact the roots too much and kill your tree.